Francophone Africa has been slower to develop palliative care than in other parts of Africa. But things are changing thanks to the International Programme of Hospice Africa Uganda, which delivers palliative care training in the French language tailored to the needs of health professionals in Francophone Africa. Sylvia Dive, a palliative care nurse trainer and the Coordinator of Hospice Africa Uganda’s Francophone International Programme, is our Guest Writer this month. Here, she explains more about the course, which IAHPC has been proud to support once again through our Traveling Scholarship grants. The International programme of Hospice Africa Uganda recently concluded its sixth Francophone Course, a five-week initiators’ course attended by 23 students from nine French-speaking African countries. The participants included doctors, nurses, a radio-oncologist, administrators, social workers, and a clinical psychologist, some of whom were in leadership positions in their home country. Students had two weeks’ face-to-face lessons on various topics in palliative care with a major emphasis on pain control. In the third and fourth week, students were put into four groups, based on their nature of work in their home country, and taken to four different practicum sites: Hospice Africa Uganda in Kampala, Mobile Hospice Mbarara, Little Hospice Hoima and Kitovu home care centre, Masaka. The placements equipped students with practical skills in pain assessment and management. Students experienced palliative care services in rural settings and were able to observe palliative care at home, in hospital, and outreach-based palliative care. and other course participants. 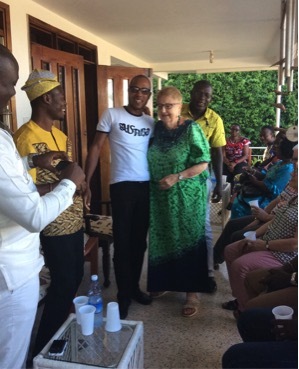 AGUE is one of three recipients of an IAHPC Traveling Fellowship who took part in the course. On completion of the practicum, students returned to Hospice Africa Uganda in Kampala for written examinations to evaluate their knowledge after the practical training. In the fifth week, ‘Training the trainers’ sessions ensured that students returned home well equipped to pass on new knowledge and skills to others in their home country. Our three traveling scholars were united in their praise for Hospice Africa Uganda’s course, commenting enthusiastically on how they plan to take forward the new experiences and learning in their own countries. AGUE Kokou Sena, a nurse from Lomé in Togo, feels that the course has given him the confidence and skills to effectively manage people with life-limiting illnesses and how to use scarce – and local – resources effectively. How to assess pain using different scales, how to prescribe oral morphine solution to patients at the end of life, or those suffering from chronic diseases; the management of constipation by reducing the dosage of oral morphine and giving laxatives such as bisacodyl, and breaking bad news to patients and families. Dr. Mary Yata Ly from Dakar, Senegal, is part of a team that provides palliative care at home. She is confident that the newly acquired skills will reinforce students’ practice and enable them to better organize themselves. 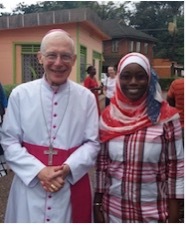 Mary is pictured here with Archbishop Michael A. Blume, Apostolic Nuncio to Uganda. Hospice Africa Uganda (follow the links to the International Programmes).